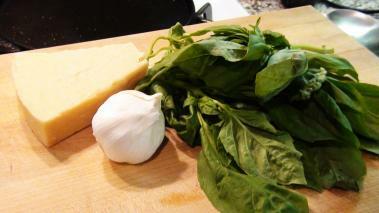 In the world of simple pasta sauces, basil pesto has to be pretty close to the top. There is essentially no cooking required, the ingredients are widely available, and once you learn the basic method, you can swap out different ingredients to “spice things up”. In this recipe video, I show you how to make a fairly traditional version. The bright green of the basil, makes a great presentation, and the combination of ingredients tastes absolutely awesome. Use fresh and high quality ingredients. This sauce isn’t cooked, and has only a few ingredients, they each need to shine. This basil pesto makes a great pasta sauce, but it’s also awesome on pizza, sandwiches and a hundred other things. Hope you enjoy, and leave a comment to let me know how it goes.